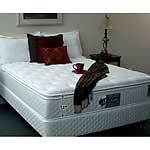 Flotation Sleep Systems have become very popular. And now, The Waterbed Doctor is offering three exceptional Flotation Sleep Systems that, we believe, will give you the Best Night's Sleep in the Industry! There are five different Water Mattresses - so you get the exact support you desire. Three of the Water Mattresses can be ordered with Dual mattresses giving each sleep partner their own temperature control and adjusted water level of support. Buy Now and Start Your Therapeutic Sleep! The Flotation Sleep 8300, 8400, and 8500 models have a water depth of 8 1/2". This water depth is similar to traditional wood frame waterbeds but offers a more conventional look. Unlike traditional waterbeds, there is no need to purchase special furniture or bedding with Flotation systems. The foundations (box springs) can be ordered in different heights to obtain the exact height you prefer. Don’t compromise when it comes to your sleep! The Waterbed Doctor’s Flotation Sleep 3500 and 4500 models have a water depth of 4" These 2 models would replace a Somma bed or any other tubes style bed with the comfort level you expect. Choose from Waveless or Free Flow Tubes - so you get the exact support you desire. Order the Top Only or with optional 4”, 8” or 9” Foundations (box springs) to create the perfect height. Buy Now and Start Your Therapeutic Sleep! Our Flotation Sleep 8500 features an extra thick pillowtop. Custom ordering with optional Latex or Cooled Memory Foam. Choose single or dual water mattress of your choice. Our Flotation Sleep 8400 features a 2.5" thick pillowtop for an extra plush feel. Choose single or dual water mattress of your choice. Our Flotation Sleep 8300 is a 1.5" non-pillowtop for those who prefer to sleep closer to the water. Choose single or dual water mattress of your choice.